An anxiety disorder that can develop after exposure to a terrifying event or ordeal in which there was the potential for or actual occurrence of grave physical harm. PTSD is considered to be caused either by psychological or physical trauma, more frequently a combination of both. Traumatic events that may cause symptoms of PTSD are f.e. (experiencing or/and witnessing) violent assault, abuse, torture, being a hostage or kidnapping – so we are talking about a wide range of settings from violence in private context up to war, conflict, disaster and catastrophes. Not everyone experiencing such events will develop symptoms. The most typical symptoms for PTSD are re-experiencing the original trauma through flash-backs and nightmares, avoidance of stimuli associated with the traumatic event, increased arousal (as irritation, anger, sleep-disorders), depression and anxiety. There is a wide range in severity of symptoms, some people might even develop “complex PTSD” (with dissociative symptoms)or a kind of “multiple identity”. On this page we have collected some useful links with information about PTSD. The DSM-IV-manual (“Diagnostic and Statistically Manual of Mental Disorders”) is published by the American Psychiatric Association/APA, it covers all mental health disorders for both adults and children. Here you will also find some lists about known causes of these disorders, statistics, prognosis, research. ICD-10 (this 10th version is in use since 1994) stands for “International Classification of Diseases”, and is published by the WHO. It`s considered to be the international standard diagnostic classification for all general epidemiological, many health management purposes and clinical use. Very short overview with some import points concerning the symptoms children may develop after trauma, contrary to adults. Scientific article, target group: specialists in that field. Very detailed overview, with chapters containing general information about PTSD, as well as about disaster and terrorism, war, and other types of trauma. Easy access overview about PTSD. Very good metaphor on treatment of PTSD. To learn more, checkout the infographic created by the University of New England’s Online MSW program. Sometimes it can be difficult to know whether distress after a personal tragedy/catastrophe is just a normal reaction to an unormal, upsetting life experience or becomes a symptom to something more serious. Most of the people exposed to a trauma are distressed over a timeperiod of weeks or month, they become anxious, may be depressed, some cannot deal with their daily responsibilities as before, they get easily upset. After a time they are again better able to function, and the symptoms will lessen. Some people however will continue to be profoundly affected by the trauma months or years later, and so develop PTSD. Lots of instruments have been developed to diagnose and measure PTSD. There are two main categories: structured clinical interviews and self-report questionnaires. So an evaluation can take from half an hour to get an overview up to several hours (when the information f.e is needed for legal claims). This evaluation is usually carried out by a psychiatrist, psychologist, or another trained mental health professional. The National Center for PTSD provides a catalogue of many assessments used to measure trauma exposure and PTSD. You will find lots of information about the scales and interviews, and the significance of each. You will not find the assessments themselves here (some can be purchased via website). A fact sheet that provides professionals/therapists with answers about the most common questions about PTSD-assessments. There are lots of assessments available, which should help to diagnose and measure PTSD-symptoms. Only some of these assessments are available for free, most of them have to be purchased. Specially the structured clinical interviews are thought to be used only by clinicians. Therefore we present here a list of the most common assessments just with names. SCID PTSD Module – Structured Clinical Interview DSM-IV / PTSD-module. Semistructured interview, to be administered by professionals/clinicians. Single item trauma event history query. MPSS-SR – modified PTSD symptom scale. 17-item self-report measure, assesses the 17 DSM-symptoms of PTSD. M-PTSD – Mississippi Scale for Combat-Related PTSD. 35-item self-report measure that assesses combat-related PTSD in veteran populations. MMPI-2 – trauma-spec. subscales – Minnesota Multiphasic Personality Inventory – 2, with possibilities in addition to the diagnoses of personality to look after PTSD-symptoms/severity. TSC is limited to professionals (should not be used as self-test). “The TSC-40 is a research measure that evaluates symptomatology in adults associated with childhood or adult traumatic experiences. It measures aspects of posttraumatic stress and other symptom clusters found in some traumatized individuals. It does not measure all 17 criteria of PTSD, and should not be used as a complete measure of that construct.” – John Briere, Marsha Runt. – Exposure-based CBT – Cognitive behavior therapy (CBT) has been shown to be the an effective type of therapeutic treatment. CBT can help the patient/survivor to recognize and change inaccurate thoughts about himself and his future. Exposure therapy is the very good technique for recovery, it involves overcoming the patients anxieties by facing them in a controlled and safe environment. The survivor relive his fears all at once (flooding) or step-by-step (desensitization) in order to overcome them. Although this may seem frightening at first, this treatment is safe and works quickly. – EMDR – EMDR stands for Eye Movement Desensitization and Reprocessing (Francine Shapiro). It is a psychological method for treating emotional difficulties that are caused by disturbing life experiences, ranging from traumatic events which could be anything from a road traffic accident to an upsetting childhood event or a war/conflict/disaster- situation. For many clients, EMDR provides more rapid relief from emotional distress than conventional psychotherapies. EMDR brings together elements from well-established clinical theoretical methods including psychodynamic, cognitive and behavioral therapies. EMDR uses the bilateral stimulation (for exemple by left/right eye movement, or tapping left/right side of the body) which repeatedly activates the opposite sides of the brain. This helps the neurophysiological system to free itself of blockages and reconnect itself. – Other psychotherapies – Some other psychotherapies have been published (reference: guideline-watch from 2009, APA) since 2004, but the utility/generalizability of conclusions are limited (methodological issues). Some approaches are more body-orientated and are seen to have success (f.e. sensimotor psychotherapy/P.Ogden, focus on the effect of trauma also on body and brain). Otherwise to mention here cognitive restructuring, psychodynamic psychotherapy, some other narrative therapies. This is a supplement to the Journal of Clinical Psychiatry, where information about PTSD, recommended approaches and therapy suggestions are collected. Target group: clinicians/professionals. It gives an good overview, which is unfortunately kind of limited because it`s edited in 1999, and some of the newer therapies (as EMDR) are`nt mentioned yet, as well as recommendation concerning medication can be partially outdated. National Institute of Mental Health, NIMH 2010. Useful booklet (20 p.)where the target group are Rescue Workers (police, fire, other first responders). Overview of the topic with description of symptoms, and how to cope (and talk) with young survivors. A review in The Cochrane Library, to assess the effects of medication on PTSD, by comparing trials. In this chapter we try to collect some articles which are highlighting some other aspects of PTSD. These may be the historical context – the origin of PTSD in the “Shell shock” of World War I, as well as some thoughts about the sociological impact or considerations on the aspect of “PTSD – a disease?” or just a normal reaction after catastrophes. This article represents a debate on PTSD with several aspects not often to be seen in a clinical daily routine, with also ethical aspects. Is PTSD always to be seen as a disease? Which impact do sociopolitical and medical aspects have on setting a diagnosis? One of the most common and distressing symptoms of PTSD are nightmares, which occur in 50 – 70% of PTSD patients. It is suggested that sleep problems are a core feature of PTSD, and that they form a risk factor in PTSD development. Despite the high prevalence of nightmares and the distress they cause, first-line treatment in PTSD does not focus on sleep. However, evidence suggests that sleep problems usually remain as residual symptoms after PTSD is treated. Study showed that nightmares occurred sometimes or more frequently in only 3% of civilian subjects. In contrast, 52% of combat Veterans with PTSD reported that level of nightmares. In other research using normative data, 71% of those with PTSD endorsed nightmares. That figure jumped to 96% of those with PTSD and a comorbid diagnosis of panic disorder. Nightmares, distressing dreams that primarily arise from REM sleep, are prevalent among the general population and even more so among clinical populations. The frequency of nightmares and related nightmare distress are linked to both sleep disturbance and waking psychopathology. Based on the extant evidence, nightmares appear to be particularly relevant to posttraumatic stress disorder, and may even be implicated in its pathophysiology. A standard part of any psychiatric evaluation involves inquiring about a patient’s sleep. Hidden in the answers that follow the basic question of, “How are you sleeping?” are the clues that are needed to diagnose what is ailing the patient seeking help. On this website we find an overview of recent developments in the field of conflict transformation from various perspectives: from academic analysts and practitioners as well as from experts representing different areas of work inside and outside of conflict zones. The site intends to provide continually updated cutting-edge knowledge, experience and lessons learned for those working in the field of transforming violent ethnopolitical conflict. Gillian Mezey, Ian Robbins BMJ, 2001. Carmelo Vazquez & Pau Perez-Sales 2011. 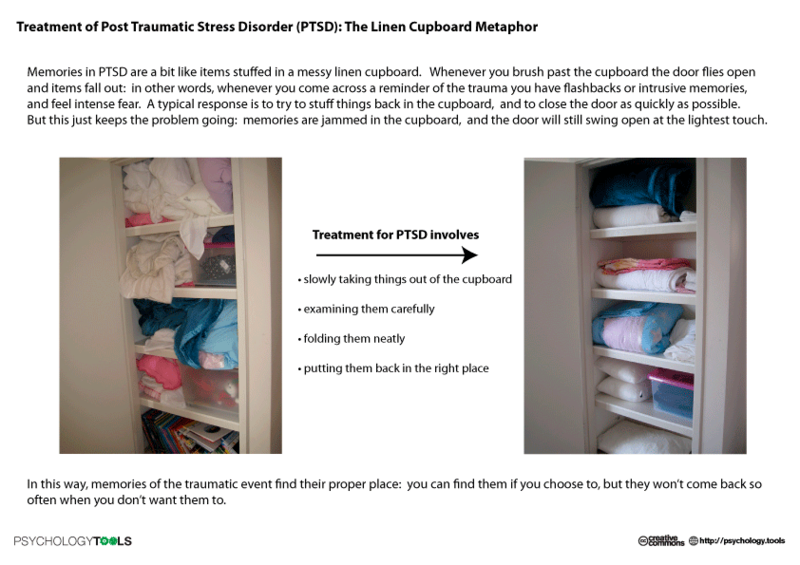 Planning needs and services after collective trauma: should we look for the symptoms of PTSD? This article presents some research results about the effect of traumatic events on the general population. Highlights how different results can be depending on measurements, definitions and other PTSD criteria used by the researcher. Here we tried to collect some manuals (partly very concrete how-to-do, partly as a textmanual with plain description of procedure) useful in targeting survivors of catastrophes, with focus on how to recognize/prevent possible development of PTSD in the aftermath. National Child Traumatic Stress Network, Veteran Affairs National Center for PTSD 2006. This is a very good manual (186 p.) about “Psychological First Aid”, means intervention strategies which are intended for use with children, adolescents, parents/caretakers, families, and adults exposed to disaster or terrorism, and in the immediate aftermath. It can also be provided to first responders and other disaster relief workers. Psychological First Aid is designed to reduce the initial distress caused by traumatic events and to foster short- and long-term adaptive functioning and coping. It comes along with lots of very useful and practical examples (f.e. how to talk to survivors). Target group: mental health and other disaster response workers. Here you will find “Presenter slides”, a slide-show which presents an overview about PTSD, symptoms, and some considerations according treatment. ESTSS is the European network for professionals in the field of psychotraumatology, and seeks to ensure continued prominence is given to all aspects of traumatic stress and its many repercussions. It promotes networking between individuals and organisations within the field of psychotraumatology. This Australian site offers lots of services addressing the needs of torture survivors and refugees. This institute offers information about the topic as well as teaching-courses (not for free available). The Center for PTSD is organized under the U.S. Department of veteran affairs. It provides information, research, education, training on trauma and PTSD to veterans and others. Dr. Bruce G. Fagel have collected useful links on how to understand PTSD. A good collection of useful links related to PTSD. This center at the University of Melbourne undertakes trauma related research, policy advice, service development and education. Their services help organisations and health professionals who work with people affected by traumatic events. Information about PTSD, trauma, research about the topic. These Trauma Pages focus primarily on emotional trauma, traumatic stress and PTSD – following both individual traumatic experience and a large-scale disaster. It provides information for clinicians and researches. It`s represents a huge collection of very useful articles and links to these topics. A site for military personnel and others, with a list of facts and resources for patients and their family members who are coping with PTSD, as well as medical professionals assisting with the care and treatment of PTSD patients. Created in 2000 as part of the Children’s Health Act to raise the standard of care and increase access to services for children and families who experience or witness traumatic events.